Right now, we are at a crossroads. Our planet, livelihoods, and democracy are under attack. While the global climate crisis is deepening, we are in a moment of political upheaval with attacks from the Trump administration on communities of color and the environment. The time to hold our leaders accountable is now. We need real climate leadership to reclaim our future. We have a critical opportunity to fight back by showing our collective power. To change everything, we need everyone. This September, California will be in the national and global spotlight as Governor Brown will host his Global Climate Action Summit in San Francisco where mayors, governors, and CEOs are expected to announce their plans to address climate change. We know that Big Oil and private corporations will be promoting profit-driven schemes filled with loopholes that only perpetuate the climate crisis, and are neither democratic or just. Real climate leadership must be rooted in community solutions. Only by building the power of frontline communities will we see the bold and visionary action on climate change we urgently need. Environmental justice communities have the solutions for our health and our planet and are leading the resistance with power and vision. It is time our decision-makers follow our lead and take action to stop the climate crisis. Fighting the climate crisis is necessarily about fighting for a just and sustainable world that works for all communities and our solutions must be rooted in community solutions from the frontlines who disproportionately bear the highest burden on their health. 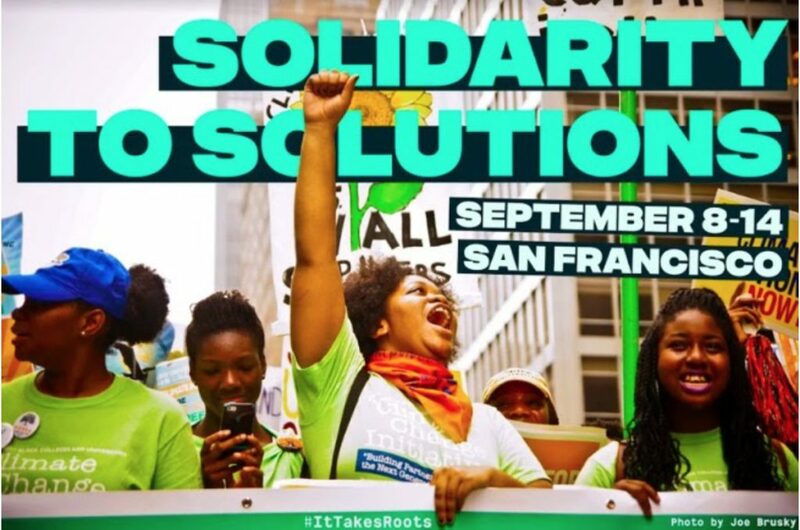 As a member of the national Climate Justice Alliance, CEJA will also be participating in a week of actions with It Takes Roots, culminating in a Solidarity to Solutions Summit on September 11th just days before the Global Climate Action Summit. Together we will challenge, expose, and stand together to stop the massive subsidies being handed to the very corporations profiting off pollution and work to move these funds to repair, restore, and protect Mother Earth and all her peoples. We need to redirect public resources to the service, solidarity, and support of communities forging the true, place-based strategies – solutions that address the root causes of climate change, poverty, and the crises of democracy. RSVP now to get details of the different activities as they are confirmed. This will be the biggest climate mobilization the Bay Area has ever seen and we need your help to to show world leaders who are gathering in San Francisco for the Global Climate Action Summit that tens of thousands of people want bold action for climate, jobs, and justice. We will be in the streets with everyday residents on the frontlines who are the real heroes and climate leaders in California to build a strong movement that seeks to transform the systemic injustices responsible for the climate crisis. The timing of the GCAS with the midterm elections on November 6th is an extraordinary opportunity for us all to determine if the boldness of our leaders’ commitments to climate, jobs, and justice matches our own, and then, let that inform our decisions at the ballot box. A true solution to the climate crisis must be rooted in racial and economic justice, and to further racial and economic justice we need to solve the climate crisis. Climate change, economic inequality, the housing crisis, increased criminalization, attacks on immigrant communities — all these challenges are driven by systemic discrimination against people of color and valuing profit over people and the planet. Climate change will only worsen these deeply entrenched issues. We need a fundamental shift that puts people and the planet first. Climate change doesn’t just exacerbate pollution — it will make economic inequality worse. Now more than ever, it is critical that the climate movement step up for immigrants and working families. Whether it is extreme heat, increased storms, or worsening air quality as a result of climate change, all of these impacts are and will increasingly be felt in the exact communities that have the fewest resources to adapt, and are already struggling with an environmental health and justice crisis. We need a Just Transition off fossil fuels to 100% renewable energy that protects workers, indigenous peoples, immigrants, and frontline communities, and creates family-sustaining jobs with the right to unionize, that are safe for people and the planet. Climate change knows no borders and to truly achieve climate justice, we must not address the climate crisis in isolation from immigrants rights, labor, and other social justice movements. Creating a more just and equitable world requires all of us, and doing so is ultimately about protecting our communities. In September, we will Rise for Climate, Jobs, and Justice to protect our human right to clean air, keep families safe and together, and build local economies to transition from dirty fossil fuels to 100% renewable energy. 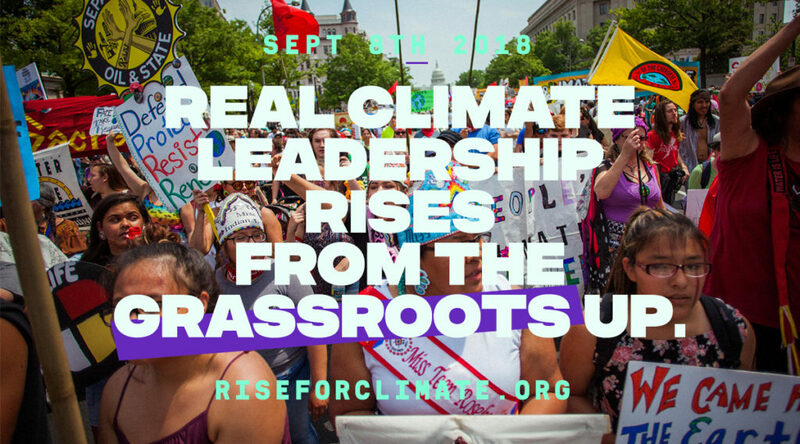 Demand the real climate leadership California needs and uplift community rooted solutions to the climate crisis by signing up and pledging to join us in September!